Send Karwa Chauth Gifts to Delhi for wife, saas, nanad. 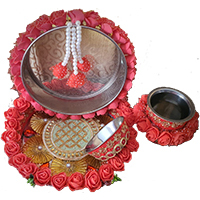 We offer karwa chauth thali, karwa chauth sargi, karva chauth puja items anywhere in Delhi,NCR to make your karva chauth memorable. Karwa Chauth is the most important festival for married women, Buy fashionable Karwa Chauth gift for Wife in Delhi with Delhi Online Gifts. 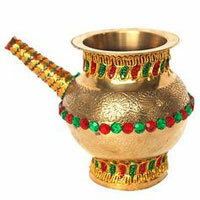 We offers all type of karva chauth gifts like Thali, Kalash (lota), Mehandi, Sindur Dibbi, Sarees..many more in Delhi,NCR. The celebration of marriage is one of the oldest Celebration in the world. In India, the marital bond between a husband and wife is considered to be one of the most sacred that is based on the foundations of selfless love, trust and unconditional companionship. In times where marriages are broken on earth faster than they are made in heaven all over the world, in India, we have occasions like Karwa Chauth, where women all over the country – predominantly in the north of India – celebrate it with much fervour and enthusiasm. Karwa Chauth falls on 27th October 2018 this year. Karwa Chauth is a festival when women show their unconditional love for their husbands by undertaking a day long fast (spending a day without any food or even a drop of water) to pray to the almighty to bless their marriage and seek prosperity and longevity of their husbands life. Celebrated from time immemorial, this day is celebrated even today in full traditional splendour. Married women who fast all day long break their fast at moonrise after catching a glimpse of the moon and then after are fed their first morsel of the day and first sip of water by their husbands. The practice of giving gifts to a married lady who is fasting for Karwa Chauth is customary. While most commonly, the husband showers his wife with gifts on this day, gifts are even exchanged between a mother to her married daughter, mother-in-law to her daughter-in-law, from a daughter-in-law to her married sister-in-law, or even between two married friends who observe the fast. 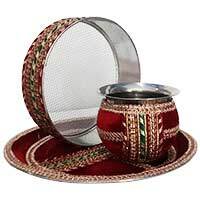 When it comes to send Karwa Chauth gifts to Delhi, there is perhaps no better place to shop than on Delhi Online Gifts. Our website always keeps such important festivals in mind and curates especially themed gifts accordingly. 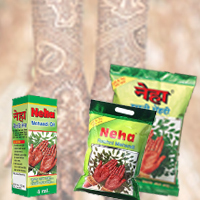 One can find a wide variety of gifts for Karwa Chauth including gifts such as Karwa Chauth Sargi, Karwa Chauth flowers, Karwa Chauth fresh fruits and dry fruits, Karwa Chauth chocolates and sweets, Karwa Chauth sarees, Karwa Chauth hampers and much more. The gifting options also include a special range for Karwa Chauth gift for her and Karwa Chauth cakes. The gifting options include items such as puja thalis, mehendi, a suhaag combo including mehendi, sindoor and bangles, silverware like silver thalis, sindoor dani, cosmetics, flower bouquets, chocolate bouquets, mithaai boxes, dry fruits boxes, assorted chocolate hampers, clothing and accessory options such as sarees, salwar suits, kurtis are the best Karwa Chauth gift for wife in Delhi. Nowadays, many families live separately in different cities. In such scenarios if you want to send Karwa Chauth gifts to Delhi, it can get difficult to ensure that gifts reach loved ones in time for the festival. With us, this problem is taken care of with our easy doorstep delivery. Whether it is a sargi that a mother-in-law wants to send her daughter-in-law, or a husband intends to gift a Karwa Chauth Gift for Wife in Delhi, we assure timely delivery from anywhere in the world. Even when it comes to payment options, our gifting portal offered secure payments in the form of direct net banking, credit card payment, cash on delivery, etc. In addition to this, one can even add in a special message for their loved ones or even choose midnight delivery. At Delhi Online Gifts, we understand the importance of the festival, help bring families closer and strengthen the bods of love that are not only shared between couples, but also between the whole families. Whether you need to send traditional puja thalis, sargi, flowers or even Karwa Chauth sweets as a surprise, we ensure that we make it easy to express your love and gratitude to a wife, mother, mother-in-law, sister-in-law or friend and make the day super special for the one who loves you most!